It's 3:15am on Saturday, January 10th, and my alarm is going off in my room at the Disney All Star Sports Resort. 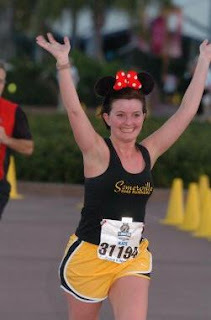 I jumped out of bed (more like rolled to the floor in exhaustion) and got ready to head out to the buses that would take me to the start of the 2009 Walt Disney World Half Marathon. I arrived at the Epcot parking lot around 4:15am and made my way over to the athlete area. 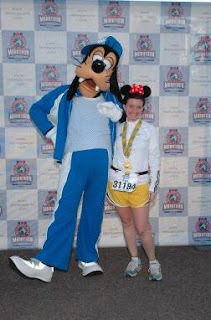 After finding my friend, Betty, who was participating in the Goofy Challenge (running the half on Saturday and the full on Sunday), we made a few bathroom trips, dropped off our bags and headed to the start. It was a long walk to the start, and her and I were in the first corral of the first wave. This meant that we were starting our race at 5:50am and had a much longer walk than most,passing all 10 corrals to make our way right up to the start line. The cool thing about being right up front was that we got a great view of Mickey, Minnie and a bunch of other Disney characters getting the race under way. At 5:50am, the fireworks went off and the race began. Since I was still recovering from qualifying in Philadelphia and working off those holiday pounds, I knew this wouldn't be a PR race for me. I stuck with the 1:45 Cliff Pacer and his group for most of the race. We made our way out onto World Drive and on to the back side of the Magic Kingdom. The race takes you through all of the Magic Kingdom, including running through Cinderella's Castle. On the other side of Magic Kingdom, I took a Gu Roctane...this stuff is like crack. It woke me up more than regular Gu and gave me that extra push to speed things up and make it to the finish. Upon leaving Magic Kingdom, the race route makes its way back to Epcot with a few "hills" (exit ramps). Somewhere on these hills, I decided to leave the 1:45 pace group and step it up a notch for the last three miles. The route winds itself through FutureWorld in Epcot and back out into the parking lot, where the finish line is. I finished in 1:43:52, with a nice healthy sprint at the end. The race itself had almost 12,434 finishers and I finished 509th overall...out of 7,181 Females, I finished 92nd. My main goal, however,was to break the top 10 in my age group. Last year, I came in 11th.This year, I finished 13th out of 1,041. My time was about 8 minutes faster than last year, but I was up against a lot more speedy 30-34females this year. I guess I'll just have to work harder and try to beat 'em all next year! !